It was another very busy day but, here is a quick post from Gumbo Limbo. 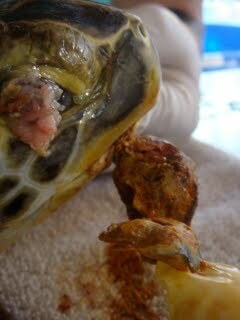 As you have seen in prior posts the FP tumors are quite significant and can cause some serious drag on these turtles. As I was treating this turtle, the tumor on its soft palate was barely hanging on. It was very necrotic, and as Connie started to treat with povidine the tumor was crumbling in her hands. The tumor was approximately 1/4th the size of its head. We disinfected the tumor and palate and then prepared to remove the tumor. These tumors are typically heavily vascularized and can bleed profusely. Due to the necrotic state of this tumor we felt comfortable that it probably did not have a blood supply feeding it. We successfully removed the tumor and there was little to no bleeding. We are getting ready for another busy day tomorrow!